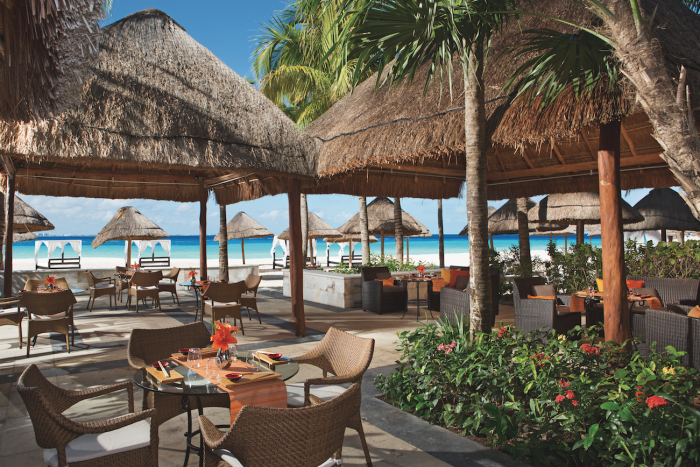 Dreams Sand Cancun features the luxury of being located close to the excitement of downtown Cancun. 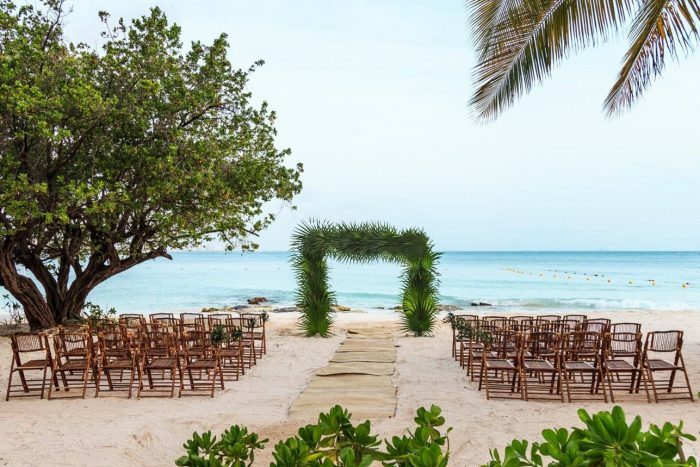 It is tucked away with its own private beach and peaceful sea, which makes it the perfect place for those who want an intimate wedding. Take a dip in the beautiful shallow waters of the Caribbean Sea, enjoy the leisurely activities, or take in the sunset from the comfort of your room as nearly every room has an ocean view. This resort makes for the destination wedding of a lifetime. 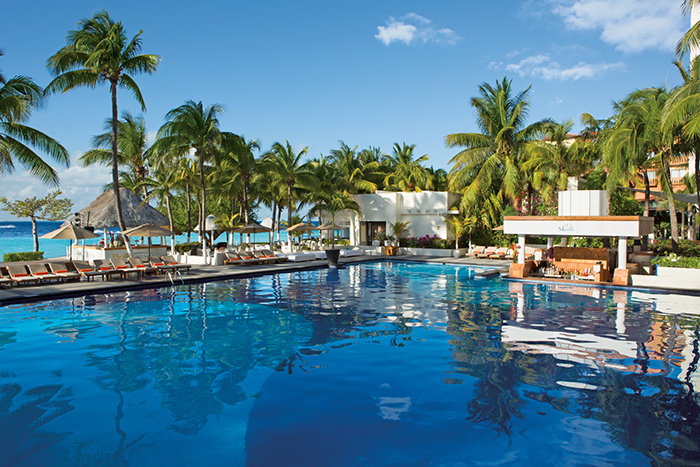 Renovations: In 2015, the resort added 11 new honeymoon suites. The resort also updated the grounds, improving the floors, walls and rooms. New decor is inspired by Modern Mexican design. As a part of the renovations, the hotel also recently added the garden area to the venue options available for weddings. 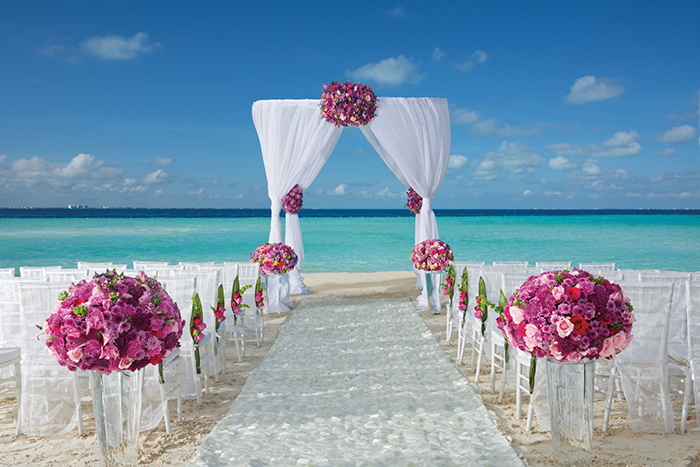 Couples looking to have a unique wedding ceremony will enjoy the shallow waters of the hotel’s beach, which allow for wedding ceremonies to be performed in the ocean. Snuggle up on a beach blanket with your loved ones and watch big screen movies on the beach under the stars! With an expansive private beach that includes an ocean trampoline, and only 2 pools, this resort is best for those who are beach lovers. Central Beach – 125 guests max, Wave Sands Beach – 125 guests max, Garden – 60 guests max. The resort will host no more than 2 weddings per day Monday thru Sunday. Ceremonies can be held at 11am or any time between 2pm – 5pm. The wedding coordinators typically respond within 48 hours. 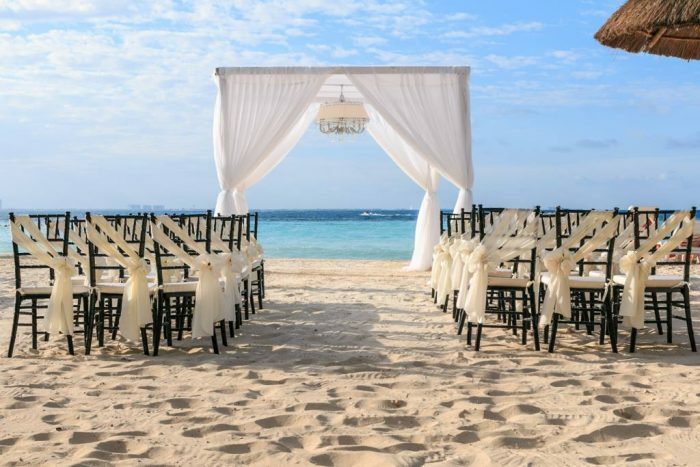 During the resort’s busy season, they may take longer.It is best to call this resort for any questions you may want to ask the wedding coordinators. Rooms range from $160 – $200 per person per night. Preferred Club junior suite rooms and rooms of a higher category include a jacuzzi in the room and two 50-minute Swedish massages at the spa. Wifi is included in every room. Children ages 2 and younger stay free, and kids 12 and younger can stay free during certain times of the year. 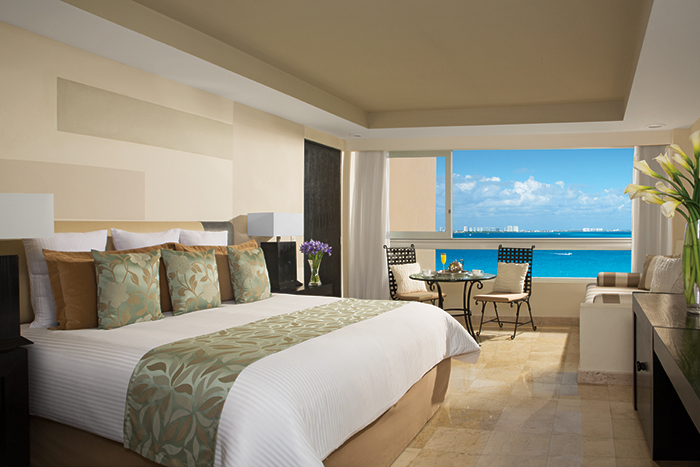 There are 483 total guest rooms that all have ocean views, and certain categories are oceanfront. The family suite is the only room to offer connecting rooms. The Preferred Club Honeymoon Suites include a whirlpool and a Bali Bed on the oversized terrace. The resort is one building that stands 13 stories high. All rooms allow up to 2 adults and 2 children or 3 adults max. The Family Suite is the only room to hold 6 guests with 4 adults and 2 children max. Adults-only rooms are available as well with 2 adults max in each room category. Children are ages 12 and younger. 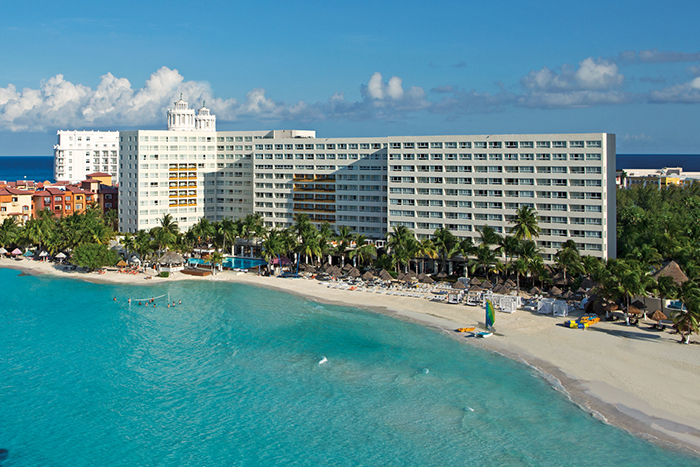 Dreams Sands Cancun is located about 15 miles from the CUN airport. 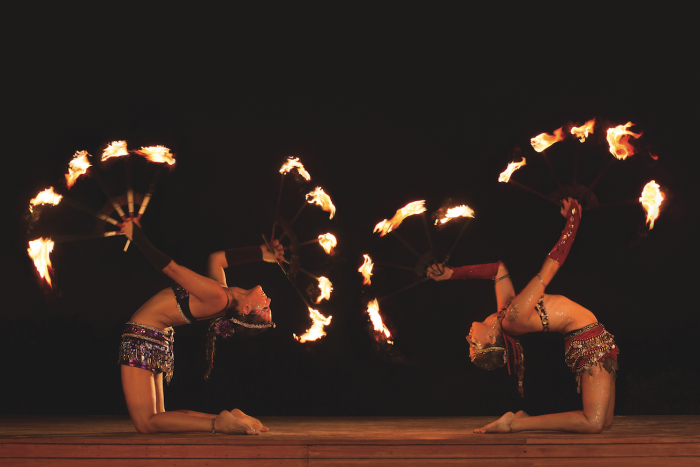 The resort is walking distance from downtown cancun. The resort hosts 1 wedding per day Monday thru Sunday. Ceremonies can be held at 11am or any time between 2pm – 5pm. A: Definitely the beach! It has the most beautiful view and is perfect for families. A: When the groom sees the face of the bride, or when she is walking down the aisle. I also enjoy that I get to meet people from all over the world. Q: Is there anything interesting about any of the venues? A: We just opened a new garden area as a part of the venues we offer for weddings!